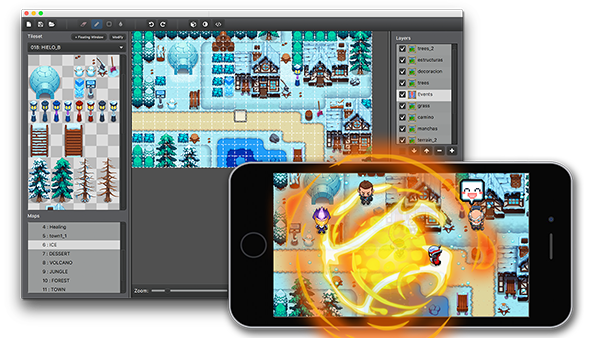 Lotus is a powerful, cross-platform 2D game engine for creating your own videogames for Windows, Mac, Linux, iOS, Android and the Web without needing to write a single line of code. Lotus offers several modules that make it a breeze to design and create your own and beautiful 2D world, as well as populate it with characters and other entities that can interact with the player using an intuitive and friendly event & behavior system. There are plenty of tools out of the box designed to help you make your game truly unique: an advanced mapping system, multiple battle engines, online functions, an animation editor, custom scenes/menus, weather effects and even Ruby scripting support! Use unlimited tilesets and layers for your maps. Tiled mapping layers (like RM). Precision mapping layers: they let you place assets anywhere in the map. Great for details. Imagine parallax mapping built into the editor itself. Variable tile size, not just 32x32. Smart Resolution Policy system: the game resizes naturally regardless of the device's screen (so it becomes easier to support most iOS and Android devices). Official builtin support for online gameplay, including leaderboards and achievements. We want to expand these features to allow the creation MMOs. On launch, it will come with two builtin battle systems. One is sideview (like Final Fantasy) and the other is Action (like Zelda Minish Cap). We have plans to add a Tactical one (like FF Tactics) afterwards. Cross-platform deployment. Windows, Mac, Linux, iOS, Android and Web. Built-in support for In-App Purchases for both iOS and Android apps. Particle systems, weather effects and shader support. Built on the shoulders of giants: we use cocos2d, one of the most successful and powerful game engines in the market. The engine runs on Windows, Mac and Linux as a native executable. Plans to expand its toolset to allow other genres. In particular, platformers with the inclusion of the Chipmunk physics library. Community Driven. We want our users to shape the future of the engine, and we will due it via very frequent updates based on their feedback and suggestions. Check out our video! Any questions are welcome here! This looks pretty dang cool. Page created in 0.335 seconds with 25 queries.